How to wash, block and store crochet. Most people know that the clothes moth caterpillar will eat woolens, but have you heard of Wooly Bears? They are the larvae of the carpet beetle. As you can see from the photo they are 4-5mm long and covered in spiky hairs. You also need to look out for brown 'husks' discarded as they shed their skins. Carpet beetle larvae will eat animal fibres such as wool, mohair, angora etc. If they are hungry enough they sometimes even chomp into synthetics. The most common source of carpet beetles is bird's nests. When the fledglings leave the nest the Wooly Bears migrate to find new food sources. They will attack wool and any other animal fibre. If you need to kill them off in crocheted items that you can't wash, such as unfinished work or unused yarn, then seal in bags and put in the freezer for a couple of days. Then leave in a warm place for a few days and finally return to the freezer. Prevention is better than cure, so try to store all your yarn in sealed bags and boxes. Finished items should also be carefully stored. And most important, try to prevent birds nesting in your loft. Soiled animal fibres are more attractive to insects, so make sure your crochet is clean and dry before storing it. I use red cedar wood moth repellents as a non-toxic and pleasanter smelling alternative to moth balls. Of course, storing your crochet in sealed boxes or bags is the best way to prevent moths and other insects eating it. The same advice applies to storing crochet yarn. Any animal fibre containing yarn is liable to insect attack. Store your precious crochet yarn in a sealed box or bag with a lavender bag or some red cedar pieces. If you hang crocheted garments on coat hangers they can stretch and end up with distorted shoulders. Fold crocheted items carefully and store them in a drawer when in use and in a sealed box or bag when not in use. Unless you've used super wash wool or a machine washable synthetic yarn you'll need to wash your finished crochet by hand. Even if the yarn is machine washable, crochet with an open texture is liable to get snagged in the washing machine. Dissolve a teaspoon full of soap flakes in hot water. (If you use too much or it will take forever to rinse out!) When dissolved, add cooler water until the water is tepid. Handle your crochet carefully when wet. Rubbing and heat both cause wool and some other animal fibers to felt. Work methodically across the item gently squeezing the fabric. Support the weight of the fabric as you take it out of the water to avoid it stretching. Gently squeeze out as much of the soapy water as you can but do not wring. Submerge in clean tepid water, gently squeeze the fabric. Carefully remove from the water and again gently squeeze out as much water as possible. 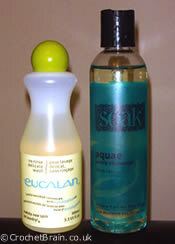 Using Eucalan wool wash means you don't need to rinse it out. It also contains Eucalyptus or Lavender extract to repel moths and lanolin to soften the wool. If your yarn doesn't contain wool you could use a product like 'Soak' that is also rinse-free. Getting your work dry as quickly as possible stops it smelling musty. Roll the wet item in a towel and squeeze gently. ( I put it on the floor and press with my foot.) Repeat with dry towels as necessary until the item is as dry as you can get it. Dry flat after reshaping and smoothing the fabric. Using an electric fan (without heat) increases the air flow and helps the fabric to dry faster. Blocking your crochet helps smooth out minor issues with tension/gauge and size. It is very important for open textured crochet as it opens out the fabric and shows the pattern to best effect. To block crochet, pin the damp item out on a padded board or on the ironing board. Place pins around the edge of the piece so it is the correct shape and size as specified in the pattern. Use rust proof pins. Leave to dry.